A House of Fancy Stationery & Drawing Instruments. 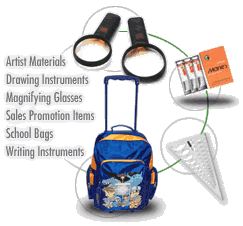 Importers and Distributors of Fancy School & Office Stationery & Drawing Instruments. AL-SAEED offers quality stationary items at competitive prices to wholesalers and retailers all over the country. We are situated in main business center of Karachi, Pakistan . We imports stationary items from the leading manufacturers of the world, including fancy school and office stationary, direction compasses , coloring material etc..
Our experience is more than 30 years, In import business of high quality stationary items , Drawing & Coloring Materials. AL-SAEED offers high quality stationery at very competitive prices.